Antique - Doulton Lambeth of England, A Pair of Faience Baluster Hand Painted Vases, Circa 1875-1890, Late 19th Century. A truly Fine Pair of Faience Baluster Hand Painted Vases by Doulton Lambeth of England. 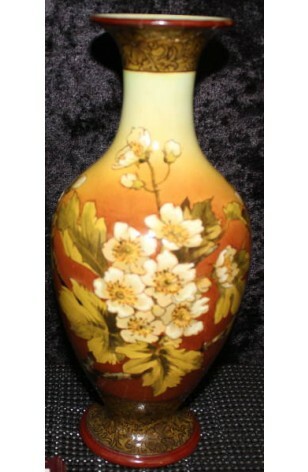 These Vases are Highly Decorated with White Flower Blossoms, Green and Yellow Foliage on Background, from Reddish Brown to Yellow and Yellow-green on the Trumpet Shaped Neck. Interior of Vase is Powder Blue Glazed. Floral Bands Encircle the Foot and Rim. Both Vase Rims have been broken and repaired, obviously years ago as can be seen by the pictures. We did clean some of the old glue excess off, but we aren't equipped to go further. However, it does come off, and they are Truly Beautiful Vases which anyone would be proud to own and Show.